It is crucial to grasp the basic proportion, bone structure as well and body muscles to be able to draw consistent and realistic human figure.You need to have an understanding of bone structures and body muscles and how they work so that you know how to draw the figure properly before you even begin.When you draw a human figure, draw according to what and how you want it to be and make sure the figure as a whole is heading in the right direction. The main focus of comic book action is on the figure.If you get this wrong, readers will not be able to understand what you are trying to tell through it.There are no tricks that can get you to drawing figure proportion quickly or instantly.Though some uses the 7-8 head count theory while others are able to draw correct figure proportion with little guidance,either way,It is going to take time to master and be versatile in drawing the human figure but the time spent will be worth it. The idea when drawing a human figure in comic books is to have a moderate amount of exaggeration when drawing their body proportion.Most of the time you will be drawing the main character of the story. If the main guy/girl is a superhero, then he/she needs to have a superheroic proportion to go with so that they stand out from the rest.Even most characters in comics are slightly exaggerated.The men looks more muscular and the women more shapely than in real life. In this chapter, we will go through the methods that can help you hone your figure drawing skills, how to draw specific body parts.We will also tackle action sequences as well as poses and the best angles to use when drawing them. The eight head count is a method in which the size or length of the the head is used to measure the height and width of a figure.The most common usage of head count method is eight heads for height and three heads for width.This method is great for beginners and for those who have problem drawing proper figure proportion.The head count method is more suited for studying the basic human figure proportion or create profile of characters you want to include in you comic. 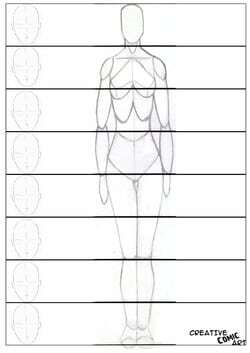 Drawing the human figure proportion requires you to be consistent, realistic and also artistic.Therefore, having an understanding of basic proportion and bone structure is essential.Here we cover the head count method which is best used for training on basic human proportion and also the difference between male and female proportion as well as children and infant proportion. In the following section we will discover the use of height and width of the front view of the model’s head to figure out how the height and width of the figure. We will also explain how to use head count for different ages. First head count always starts from the top – Example: Drawing an average male starts from the top of 8-heads, while drawing children starts from the top of the 5-6-head. The male proportion is actually used as the basis of many humanoid form. Fantasy creatures and aliens that has similar physical figure can use this proportion with a little tweak.For example; a normal male figure measures around eight head tall and three head wide.You can create a different form by merely changing the height and width measurement of the figure.Add other distinctive characteristics to show some difference when compared to. 1st Head count – starts from the top of the head to the bottom of the chin. 2nd Head count – ends under the armpit, usually includes the shoulder and the neck in this. 3rd Head count – ends at the navel area, under the ribcage. 4th Head count – ends at the crotch/groin area. 5th Head count – ends at the tip of the fingers if the hands are place straight down or near the hip.If not , draw two lines all the way under the knees (this includes the 6th head count). 6th Head count – ends under the knees. 7th Head count – ends slightly in the middle of the shin, under the calf muscles. 8th Head Count – calves muscles – ends at the feet. The female proportion can be used in the same manner as the male proportion but there are some features that need you need to include in order to make the figure more feminine. Neck should be narrower and longer. Slightly narrow arms, rounder and more slender hands/fingers. Legs are more rounder and wider at the top (upper legs). -The infant head length start at the same width as the shoulder. -The first head count starts at the top of the head and finishes at the end of the chin. 2nd Head count – stops above the navel. 3rd Head count – ends at the knees. 4th Head count – the last head count finishes where the feet meets the ground. 1st Head count – begins at the top of the head and stops at the end of the chin. 2nd Head count – ends below the sternum of the rib cage. 3rd Head count – finishes at the crotch. 4th Head count – ends at the knee. 5th Head count – stops at the ankles. 6th Head count – the final head count (or half) ends as the feet meets the ground. As this this a theory-based principle, not all figures you draw will have this 8 head count. We encourage you to use the guideline to have a proper proportion of a figure and not ultimately rely on this theory ….at least not forever. Why not? Because this theory is used basically to improve on your accuracy and hone your observation skill on drawing proportion. School teachers commonly used this method to train and help students mostly in still life art or figure drawing.Therefore it is best for newbie comics artist and beginners in comic art for training and getting the grasp of basic human proportion but is not advisable to rely on them because comics includes a lot of action, movement, gestures and poses and along with personalized style, it is best to practice base on practicing and sharpening your skill. According to Albrecht Durer, a painter and print-maker who made extensive research in understanding the human proportion in his work titled The Four Books On Human Proportion (1528), he concludes that over-analyzing the human figure can make a person lose its artistic purpose and relations to its practice.Many beginning students enter a figure-drawing /anatomy class wanting to measure every square inch of the human figure to make a mark on the paper. Although such approach is commendable, the main reason we decide to include this is because in comic art it isn’t all about photo-realistic, perfection of human figure. If this is your first time drawing , do not become overly attach to having a perfect (or near perfect) measurement of the body part because people who do as such tends to draw figures rather stiff and off balance.In comics, when drawing human figure mostly, comic artist are known to exaggerate the human figure be it male of female. We also found out that the head count theory is less suited for figures in motion or poses which is commonly used in today’s comic, try using the stick figure method instead. We thank our friends at RedeemBonusCode.co.uk for supporting CreativeComicArt.com.